The Aug 29-30 edition of The Business Times had a very interesting article by Woon Tai Ho entitled "The Next Big Thing?" In it, he discussed the "heightened interest in contemporary Filipino art... younger Filipino artists tend to be influenced by previous Filipino artists rather than foreign artists, so there is a distinct look and feel to Filipino art". As one art gallery owner put it - "I do believe it is a very special era for Filipino art." 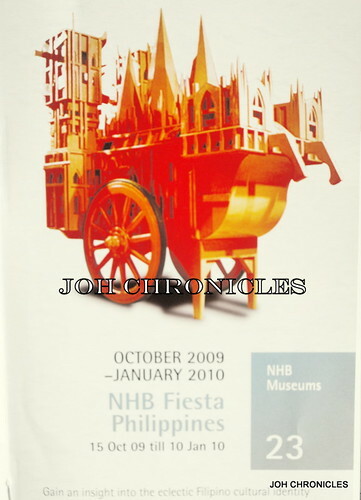 "Gain an insight into the eclectic Filipino cultural identity through exhibitions held in our various museums. Take a trip to the land of legendary hospitality with star artefacts from the Ayala Museum, National Museum of the Philippines and other collections displayed in the Asia Civilizations Museum. You can also indulge in song and dance with performances by Philippine cultural groups. The festival kicks off with Bayanihan: The Spirit of the Philippines at the Philatelic Museum, followed by a fiesta of contemporary artworks in the Singapore Art Museum exhibitions - Thrice Upon A Time and In the Eye of Modernity: Philippine Neo-Realist Masterworks from the Atenean Art Gallery - as well as cultural performances at the National Museum of Singapore." Singapore Art Museum presents two exhibitions that offer a sumptuous feast of Philippine visual art, in conjunction with the NHB Philippines Fiesta. Audiences can expect to savour works from the Philippine grand masters to some of her most exciting contemporary practitioners. What is the story of the Philippines? What are her epics, myths and histories? And who has the authority to speak, to tell her tales? Thrice Upon A Time takes a contemporary look at the very old notions of stories and storytelling, and with it, the idea of the artist-as-storyteller. Spanning across a century of art, the exhibition draws from SAM’s Permanent Collection and loans to showcase works by Juan Luna, Fernando Amorsolo, Carlos ‘Botong’ Francisco, Ben Cabrera, Anita Magsaysay-Ho, Charlie Co, Jose Tence Ruiz, Poklong Anading and Rodel Tapaya. The show also includes a rarely seen painting by the Philippines’ national hero, Jose Rizal. In the Eye of Modernity presents the Neo-Realist Masterworks from the renowned Ateneo Art Gallery in Philippines. The show traces the development of Neo-Realism in Philippines, notably, artists in the 1950s to mid-60s who adopted a modernist approach to ‘re-presentation’, through semi-figurative distortion and abstraction. Featuring the post-war modernists such as Arturo Luz, Vicente Manasala, Jose Joya, HR Ocampo and Cesar Legaspi, the exhibition represents the largest overseas loan of artworks to-date by the Ateneo Art Gallery. The show is presented in partnership with the Department of Foreign Affairs through the Embassy of the Philippines’ Art Trek III. I hope that there will be sessions at the ACM, SAM and National Museum geared not only for the adults but also created specifically for the young as it is they who need to establish a thread of connection to the motherland. Ah... on the top of my wishlist... John Silva!